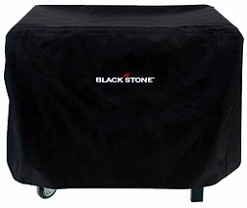 Blackstone Portable Commercial Griddle - Canvas Cover. Shipping included in the price when shipped to the continental 48 United States. Keep your Blackstone Commercial Griddle safe with this 1184 griddle cover for the 1180, 2-burner gas griddle. This unit is custom fitted to entirely cover your 1180 griddle when it is not in use. The cover is weather resistant and will keep your griddle protected from the elements. Do not worry about tears with this extra heavy-duty cotton canvas reinforced corners. The cover will clip securely to the griddle to keep the cover from being blown away. Custom designed to fit the Blackstone 28" Portable Commercial Griddle. Made with extra heavy duty canvas. Product ships from Utah via FedEx Ground Service. Typically leaves the warehouse within 2 business days and takes about 3-5 business days in transit to the continental United States. 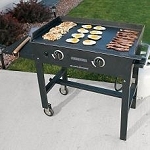 Competitive Edge Products will try to match or beat any online competitor's advertised price for the 1184 Blackstone Griddle Cover (price of the product + any shipping and handling costs). and the heavy duty canvas will last a long time, also has straps at bottom, front and rear to secure with. Thanks for the FAST,FREE shipping, GREAT cover. Was really impressed with the quality of this custom made cover for the Blackstone stove set up. Very heavy duty, well made, and looks great. You must fold down the side table, and I stack the grill on top of the griddle before putting on the cover. Was surprised to find a well made slot on handle side so you can still use handle to move stove around while fully covered. Great planning and quality all around!